diaper free | Midwives, Doulas, Home Birth, OH MY! Your Baby is Potty Trained? We practice EC (Elimination Communication), which is basically an understanding that babies are born knowing when they have to eliminate and that they give the parent (or other caregiver) cues to let them know when it’s “time”. Sounds weird and practically impossible, right? That’s what I thought too! I remember reading an article in Brain, Child magazine called “To Catch a Pee”, and thinking it was really gross that the author sometimes took her baby pee in a sink. Then I watched two of my friends utilize the practice. When I started using EC with my now 3 year-old, it all made sense. If you want to read more in-depth about the hows and whys, there are many great resources out there, such as the Diaper Free Baby community. Big brother gets in on the pottying. M is 8 months old here. Fast forward several years, and I watched my friends utilize EC with their little ones. I found it fascinating, but thought it was also time-consuming and a bit weird. While I got the concept, sort of, it seemed like a lot of work. Then, I got pregnant with C and read the book, “Diaper Free” by Ingrid Bauer. M and I decided we’d give it a try, just to see what happened. We thought of it more like an experiment. Surely it wasn’t that easy, right? Babies didn’t really respond to that! One day, about six weeks or so after C was born, I decided I’d give it a go. I had been trying to pay attention to any signs that he needed to go and noticed that he made a little grunty sound right before he pooped. I hadn’t yet caught on to a pee “signal”. Since we used cloth diapers, I could quickly tell whether he’d peed or not just by touching the diaper. 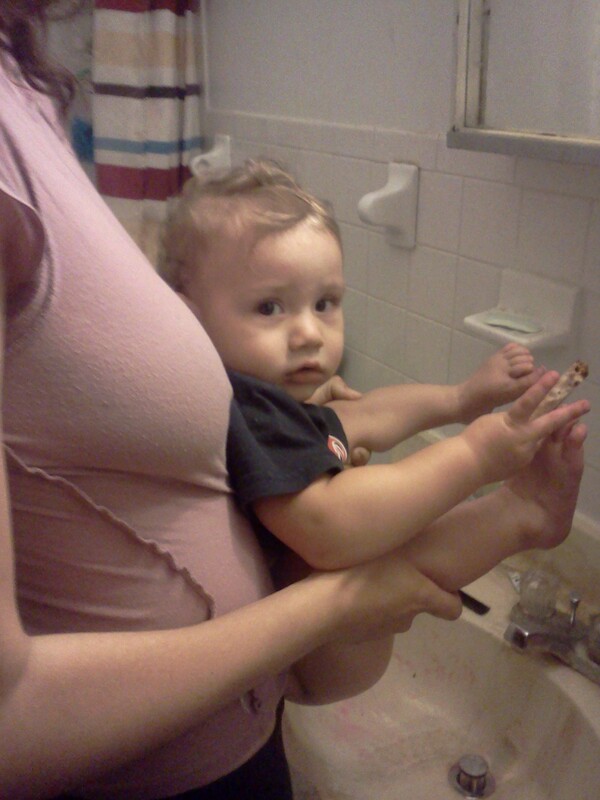 When I knew he was dry but hadn’t gone in a while, I held him over the sink and made a “sss” sound. He peed!! I got really excited and yelled at M to come see. That sounds really dumb, I know, but after talking with other parents who also EC, it seems pretty common for those first few “catches” to feel exciting. I think it’s just so surprising that it works, as well as a realization that our entire thought process about how/why/when babies eliminate is wrong. Everyone has their own “style” when it comes to EC, some people use a sound like “sss” or “ZZZ”, others say “pee” and others may grunt or use another nonverbal cue. Personally, I like the “sss” sound and it’s worked well for us. The position I use for M is always the same, whether I’m holding him over a toilet, sink or the grass (see picture below). This seems to be a pretty standard position, making the elimination easy for the baby as well as avoiding getting the waste in a big area. Because the legs are lifted and the bottom is the lowest point, there is often nothing to actually wipe. I hold him like this until he’s done…for pee, he’ll usually have an involuntary shudder. For poop, he usually will stop and get antsy, so I stop and wipe, then try again and repeat until he’s truly done (generally about three times of repeating this). For us, a relaxed approach to EC has worked best. 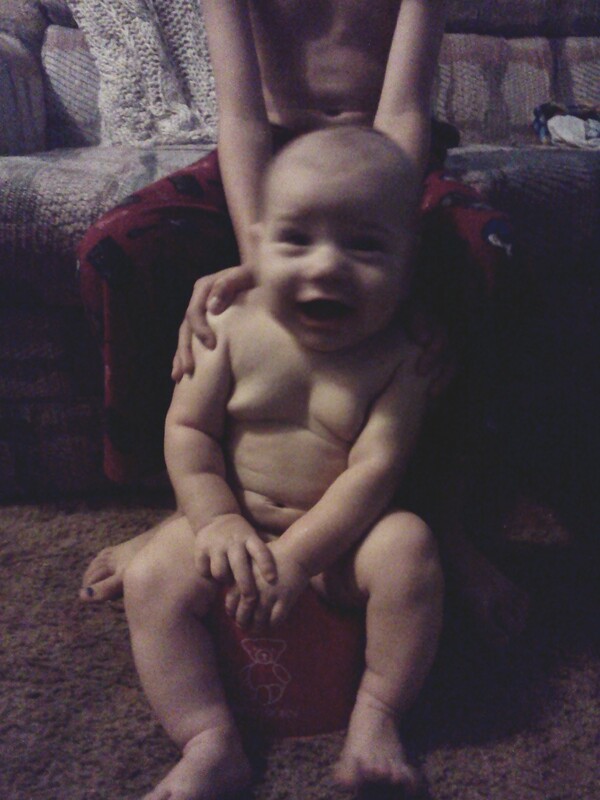 We have diapers and we use them, especially when we’re not home. In my opinion, every time he uses the potty instead of going in his diaper, we’re accomplishing something. Some days, we do great and others we don’t. Yesterday, for example, he only used one diaper. Some days, he’ll go through several. I try to take him to the potty often when we’re out, but there are times I get busy and forget. I don’t beat myself up about these times…that’s just the way it is. I have to admit, though, that even after all this time, I get excited when we’ve had a good day with no accidents and no wet/dirty diapers. It means we’ve communicated successfully with each other! I don’t think I’ve given any great advice and maybe haven’t even explained what it is we do very well! Here are some basic tips that may help, but I think the main thing to keep in mind is that it’s a learning process ~ especially for us parents ~ and don’t be too hard on yourself or caught up in doing it “right” every time. We live in a fast-paced, non-baby-friendly society…which does not make practicing EC (or many facets of parenting, really) on a regular basis very easy. 1. Read the book and ask friends/acquaintances who’ve practiced EC. Ingrid’s book is thorough and a great jumping-off point. She explains the theory behind it, basic steps and also some stories from parents. It’s an easy, quick read. Asking parents you know is another great way to get some information. Many of us love to talk about it, because it’s fascinating and really does work! 2. Gather supplies. There aren’t really any supplies you *need* to have on-hand, but some things do make it easier. If you plan to start early on, invest in some pull on pants instead of one piece sleepers. The sleepers are harder to get babies in and out of, something that’s essential when you’re taking them potty as opposed to just changing them. Something to use as a potty is nice to have, for night-time, car rides, or any time you don’t want to have to run to the bathroom. Most stores now have plastic infant potties available, but a stainless steel bowl or whatever similar you have on hand will work just fine, too. We have two potties that rotate spots. I like keeping one in the living room to encourage M to use it on his own (with the unfortunate side effect that C thinks it’s fun to use also). The other one floats from the car (for visiting friends or when it’s not appropriate to just go on the ground) to the bedroom (for night-time, although I usually just get up and take him to the sink in the bathroom). That’s pretty much it. 3. Give it a try. If you haven’t yet caught on to baby’s “signal”, you can start out by guessing or you can let baby be naked for a while and then try. One of M’s signals that I caught on to early was squirming at the breast. If he obviously wanted to nurse but kept popping off or wouldn’t settle there, I would pee him and then he’d be fine. It was one of the first signals I recognized. Sometimes night-time is an easier place to start, as they aren’t doing anything else and it is glaringly obvious…they’re fast asleep and then start wiggling about, bunching up or just wake up altogether. Most likely, there’s a need to pee. It may take a few tries to actually “catch” a pee/poop, but eventually you will and then you’ll be hooked! Another option is to try to pee baby while he/she nurses. I did this with C in the beginning of our EC journey, while I was getting the hang of it. If baby is not yet holding up his own head, you may feel safer just pulling up his legs while he’s nursing or in that position, as opposed to the sitting style. 5. Consider using sign language with baby. I recommend this useful parenting tool whether you EC or not, but it seems (to me) to help amplify the ability to communicate with baby early on. C talked quite early, so he could tell us plainly when he needed to go or had just gone. M is not as verbal yet, he seems to prefer grunts and single syllables. Having the sign language has allowed him another form of telling us his needs. In this way, even later talkers can give you an external, visible signal that they need to eliminate. If nothing else, it certainly doesn’t hurt and takes no extra time to make the hand gesture while saying “pee-pee”. We use the ASL (American Sign Language) sign for “toilet” for both pees and poops, shown below. 6. Know the drawbacks. There aren’t many drawbacks to EC, but there is a big one…you can’t go back. Once you see and know that your baby is capable of communicating her need to eliminate, has sphincter control from birth, etc., you can’t UNsee or UNknow it. You will always be aware of it. You may get busy and overlook a signal, need to put your child in a daycare where they think you are nuts for EC, or any other myriad of things, but you will always have that knowledge. You might then feel some guilt if you, for any of the reasons mentioned previously, need to stop EC’ing. There are times, like when I’m sick or just really, really tired, that I know M needs to potty and I don’t do it. I recognize that this is not fair to him while also acknowledging that I just won’t catch every time…and that is okay. Know that going into it and give yourself the grace when it does happen. Should you find yourself with a particularly strong-willed child, also know that he may utilize his urine as a defiant tool. Both my close friend and I have been blessed with incredibly intense, strong-willed children who have intentionally peed in places or on things as an act of defiance. Yes, this may happen with any child, but it feels more definite (?) when they’ve been going potty for quite some time. I have seen my (then) 2 year-old look at me when I said “no” or otherwise rebuked a behavior/action, then pee while continuing to look at me like “What are you going to do about that, eh?” They have also used their pee as weapons when other children are bothering them or as threats (“If you don’t let me do xyz, I’m going to pee on this toy.”) If you overlook the gross factor, it’s actually quite ingenious and somewhat funny. In any case, be prepared for that possibility.